Want to learn more about how subsidence has impacted this region? Click here to read our blog about how it could be addressed with a new USGS subsidence mapping tool. Since 1836, groundwater withdrawals have caused about 3,200 square miles of the Houston-Galveston area to subside (or sink) more than a foot, with some areas subsiding as much as 12 to 13 feet. Over the last century, aquifers in this area have lost between 300 and 400 feet, leaving some of the land to collapse. In reaction to the subsidence issues across the Houston-Galveston region, the Texas Legislature established the first subsidence district in 1975 to reduce or minimize further groundwater subsidence in their area. The district implemented their first groundwater regulatory plan in 1976. By 1977, an extensive groundwater well-monitoring network had been established and the USGS had collected water-level data that were used to create the first published water-level altitude maps of the Chicot and Evangeline aquifers in the Houston-Galveston region. Managing how groundwater resources are used is key to controlling subsidence. This is accomplished through the careful regulation of groundwater withdrawals, working in collaboration with surface water suppliers. Purpose: To manage groundwater withdrawal and enforce groundwater regulation throughout Harris and Galveston counties, in hopes of preventing the land subsidence that leads to increased flooding. This district was created because area residents and local governments were becoming increasingly alarmed by subsidence’s continued impact on the region’s economic growth and quality of life. Purpose: To manage groundwater withdrawal and enforce groundwater regulation within the district to prevent subsidence. This is because in addition to sinking land elevations, subsidence contributes to flooding, inundation, or overflow of areas within the district, including rising waters resulting from storms or hurricanes. The district’s mission is to control land subsidence and manage groundwater resources through regulation, conservation, and coordination with suppliers of alternative water sources to assure an adequate quantity and quality of water for the future. Purpose: To preserve, conserve and protect Montgomery County’s groundwater supplies. 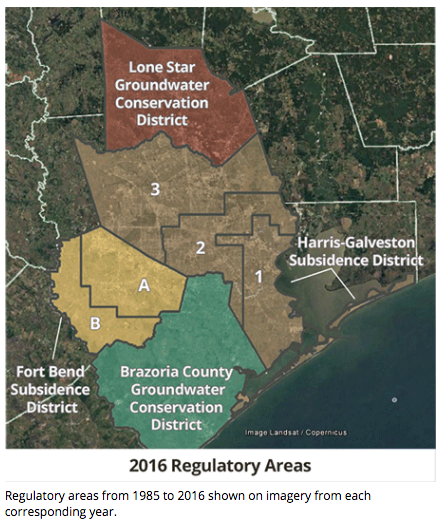 The Lone Star GCD has studied the Gulf Coast Aquifer for a decade and confirmed the reports of many local water suppliers, which state that water levels in the county’s aquifers have declined at an alarming rate as a result of deficit pumping. The district’s vision is to manage the groundwater resources so that, in the near future, the amount of groundwater withdrawn from the Gulf Coast Aquifer is no more than the average annual effective recharge to the Gulf Coast Aquifer System. Purpose: To maintain the quality and availability of Brazoria County’s groundwater resources for current users and future generations. The district proactively works with its groundwater users to address issues such as how to most efficiently use groundwater, control and prevent waste, control and prevent subsidence, and address drought conditions. From USGS well monitoring over decades they are able to show that once subsidence districts are created, groundwater levels rise significantly, thereby decreasing subsidence issues in their districts. 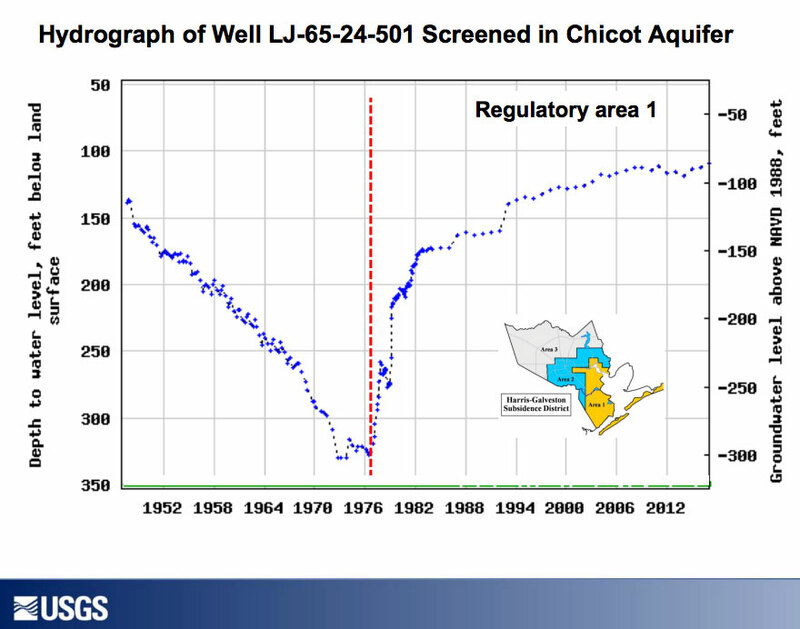 The nearby hydrograph shows that when a subsidence district was created around 1976 (red line), groundwater levels in the Chicot Aquifer rose substantially. While some areas in Houston have significantly reduced their groundwater pumping (particularly with the creation of subsidence and groundwater districts, whose purpose is to regulate groundwater pumping), subsidence still remains a threat for the region.